The Province of Port Phillip was formerly divided into two districts Western Port and Portland Bay each having a Commissioner of Crown Lands. These districts were also called the Counties of Bourke and Grant in all matters relating to the sale and registration of lands. The boundaries of the counties were not then fixed upon; but left to be determined when the progress of the surveys – the opening of new townships – the increase of the population – and the alienation of land from the Crown – should render it expedient to subdivide the districts, and to increase the number of the counties. When the township of Portland was opened, at a distance of 150 miles from the capital of the county of Grant, it was considered expedient to define the limits of that county, and to make the township of Portland the nucleus of another county to be named Normanby, the boundaries of which will remain undefined until some intervening township shall be opened. At the commencement of this year, Lieutenant Addis was appointed Commissioner, of Crown Lands for the County of Grant, Captain Fyans still holding the appointment of Crown Commissioner for the District of Portland Bay. A considerable degree of uncertainty has since existed with respect to the boundaries of the respective districts under the jurisdiction of these two commissioners, many supposing (our selves among the number) that their limits were not distinct and independent, and that they might clash with each other in the performance of their duties; no notification of any change in the boundaries having been published in the Government Gazette, and the Proclamation of the first of July 1840 still remaining uncontradicted. It is with considerable gratification therefore, that we publish the following description of the boundary of the County of Grant, now for the first time made public. Lest the above description should not be quite intelligible to the general reader, we shall subjoin a few explanatory particulars. The county is bounded on the east by the waters of Port Phillip, from the Werriby to Point Lonsdale; and on the south by the ocean, from Point Lonsdale to a point near Cape Otway. The River Barwon rises in the high land near Cape Otway, and runs nearly 30 miles N.N.E., forming part of the western boundary of the county. It is then joined by the River Lee and the Native Hut Creek, and turns to the eastward, running through the centre of the county. The remainder of the western boundary is formed by tracing up the Native Hut Creek, to the point where it is crossed by the road from Buninyong to Melbourne then along that road, on the northwestern side of Station Peak to the crossing place on the Werriby near Greeves’s Inn [see note below], the remainder of the boundary being the River Werriby. It is difficult to give an idea of the extent of the county from its exceedingly irregular outline. In size, it is smaller than the average of the nineteen counties of the Middle District. Its extreme length from the Werriby to Cape Otway, is about 70 miles. Its extreme breadth from the Native Hut Creek to Indented Head is about 40 miles; but its average breadth is little more than half that number. The area of the county may be about 1500 square miles. It is somewhat strange, that although the boundary has been thus definitely fixed, the land in the neighbourhood of Lake Colac which has been advertised for sale, is described as being in the county of Grant, although twenty miles beyond its boundary. When the land comes to be registered in the Supreme Court, this will be found to be a rather awkward misnomer. A new inland county will no doubt soon be named, which will include these lands and the whole district of Geelong will eventually become divided into six or seven counties. Of the land which has been advertised as open for selection, only two of the parishes (Murghebolac and Carrungemurnong) are properly within the limits of this county, the remaining three (Parwan, Elliminyt, and Nalangil) are in counties not yet named. In the account of the Census which appears in to-day’s paper, it must be borne in mind that the comparatively small number of inhabitants in the county of Grant as compared to the population of Normanby, is owing to the circumstance of the latter not having any fixed boundary, and spreading over the space of nine or ten counties, so that in one place it comes within fifteen miles of Corio, and at another within twenty miles of Melbourne. The boundaries of the county of Bourke have also been defined, but no secondary county has yet been named. A change in the Commissionership, similar to that which has taken place here, has also been made, Mr. Airey having been appointed Commissioner for the County of Bourke, while Mr. Powlett continues to hold his situation as Commissioner for the district of Western Port. 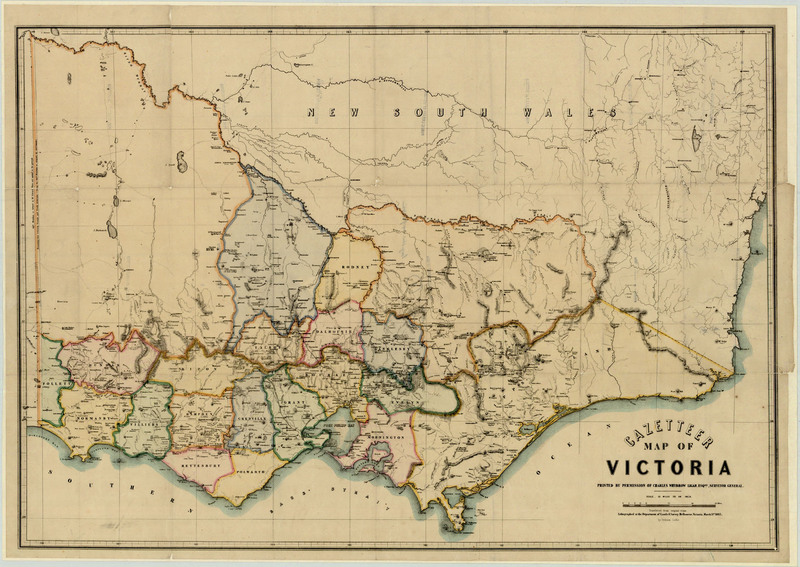 The map above is from the State Library of Victoria and titled Gazetteer map of Victoria, March 31, 1865 and shows ‘towns, counties, railways, telegraphs, gold mining areas and some pastoral stations. Relief shown by hachures and spot heights’. La Trobe had special interests in other parts of this district. He and Fenwick delighted in camping and fishing by the mouth of the Barwon River where, in company with Major Mercer and Mr Learmonth, the Superintendent caught and cooked his first snapper over a campfire. To expedite his journey from East Melbourne to Geelong he sent a relay horse in advance to Greeves Inn by the Werribee River; next morning he would ride twenty miles from home to have breakfast at the Inn, change horses there and reach Geelong by 11 o’clock; on more than one occasion he made the entire return journey in one day.